I had to pick only a few fashion staples that every girl should have in her closet, a good chambray shirt would be at the top of the list. 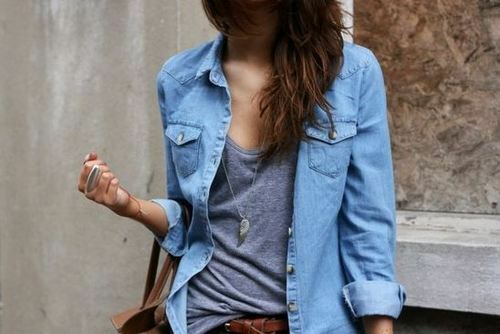 Chambray shirts are so cute and so versatile. 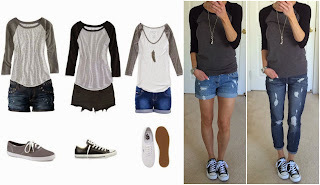 They can be styled so many different ways, and they can also be worn during any season. And let’s not forget about the fact that they are super comfy, especially if you find one made with soft denim. Personally, I have two chambray shirts that I can’t live without: one in a darker wash, and one in a lighter wash. I woIfuld recommend getting both, because they’re so great to have and each will feel fresh in it’s own way. I love the darker wash for fall and winter, while the lighter wash is perfect for spring and summer – but really, they can both be worn whenever. 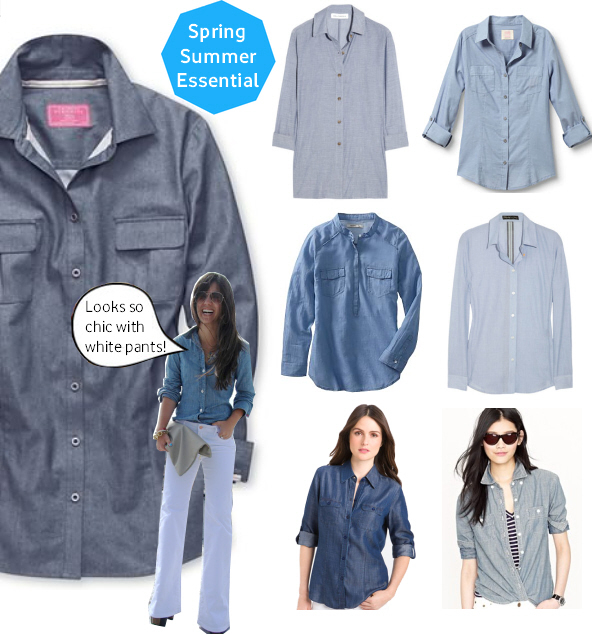 The best thing about chambray shirts is that they’re usually super affordable. I mean, yeah, you could spend 1000 on one at J. Crew, but you could also get a great option at American Eagle, Old Navy, The Gap, H&M… basically anywhere. But what do you do with it after you get one? 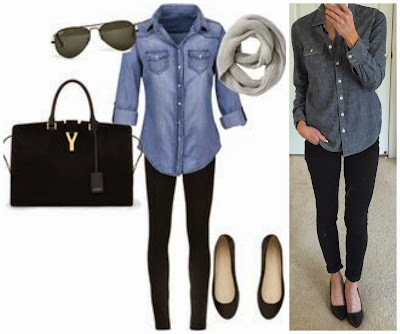 Here are 20 fabulous s tips on how to wear a chambray shirt no matter what the weather is like. The trick? Thinking of the denim shirt as a neutral… which it basically is. 1. Pair it with any of your brightly colored jeans. It’s a fresh take on denim-on-denim. 2. Tuck it into a polka dot skirt. Dots and chambray = match made in heaven. 3. 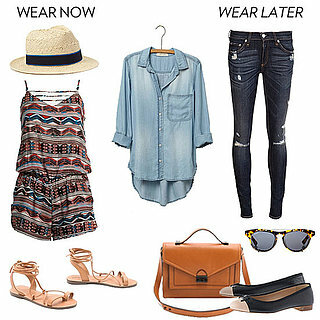 Don’t be afraid to wear denim-on-denim. My favorite way to do it is to mix light and dark washes instead of just one wash, but either work. 4. Instead of a cardigan, wear a chambray shirt over your dress. 5. Keep things simple and tuck it into a black skater skirt – cinch the look with a cute belt. 6. 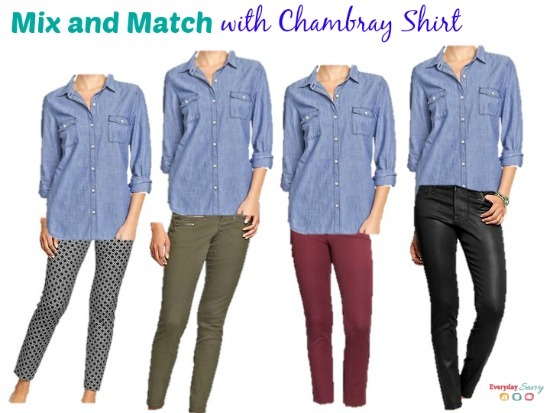 Chambray shirts look amazing with white jeans. To keep it from being too bland, add lots of bold accessories. 7. Use it as a coverup at the beach. Perfect for windy days! 8. 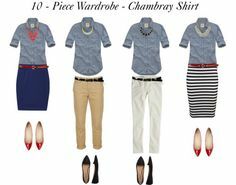 Copy this cut einfographic, and pair your chambray shirt with striped shorts or a flowy skirt. 9. Tie the bottom and wear it over a dress to put a new spin on it. I love this idea so much. 10. Make your favorite sequin skirt work for the day by tucking your chambray shirt into it. 11. On chillier days, wear it under a blazer for a professional look. 12. 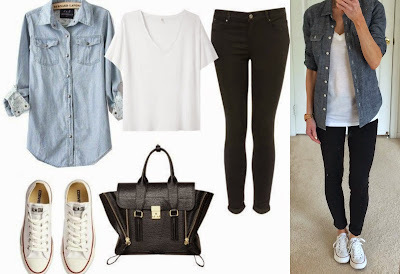 Choose any of these looks for a perfect spring outfit. 13. Layer your denim shirt under your favorite sweater. 14. Make a crop top work for colder days by putting it over a chambray shirt. This is also a great way to incorporate crop tops into your wardrobe without exposing your stomach. 15. Wear it open or buttoned with a cute pair of floral jeans. 16. Tie it over a maxi skirt for a super cute look. 17. 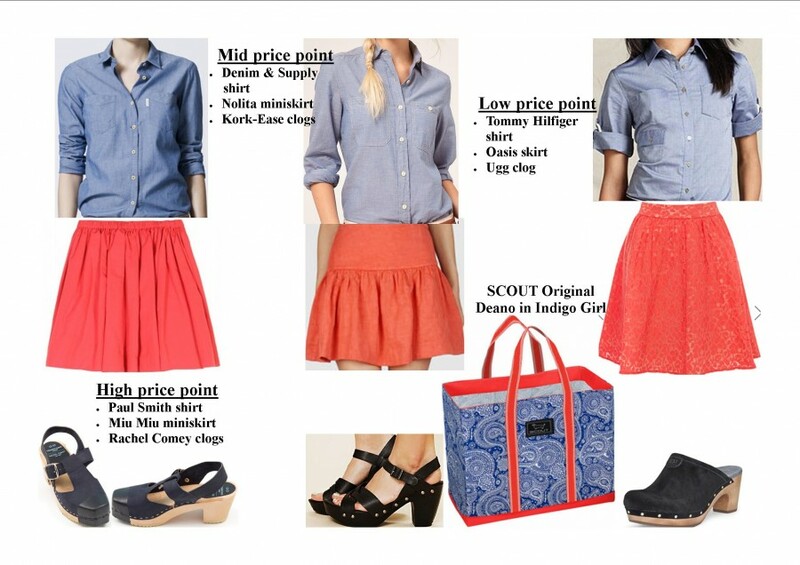 Balance out the femininity of a full or pleated skirt by pairing it with a casual chambray shirt. 18. Wear it over leather pants for a fun mix of fabric. A leopard scarf also looks amazing with a denim shirt. 19. Button it all the way to the top, then add a large statement necklace over it.